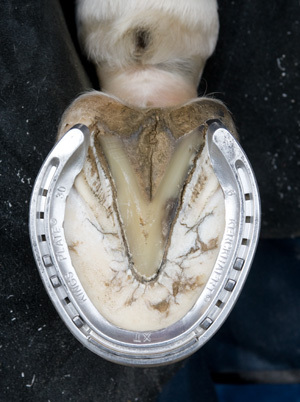 This style of shoe, with a flush toe insert, is used throughout the world on turf (grass) racetracks. It is sometimes referred to as a Queens® or Turf plate. The toe insert does not provide traction, only functioning as a wear plate so the toe of the shoe does not wear too quickly. It is a style of shoe that is sometimes used in other disciplines, for example the western pleasure quarter horse or show hunters that are looking for a light shoe.